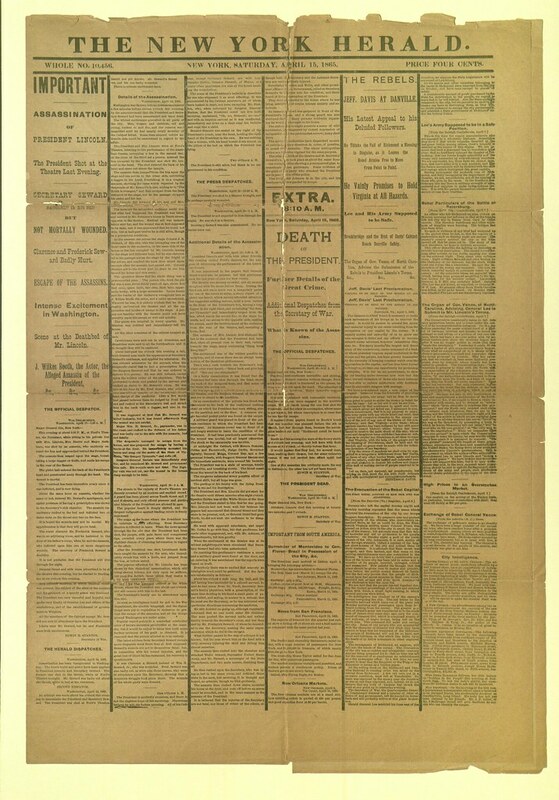 On April 15, 1865, newspapers were given the awful task of announcing the assassination of the sixteenth president of the United States: Abraham Lincoln. The night before went down in history with one gunshot. John Wilkes Booth, an actor and confederate, mortally shot President Lincoln at Ford's Theater in Washington, D.C., jumped from the balcony, and yelled, "sic semper tyrannis" ("thus always to tyrants") as he fled the scene. One must wonder, on this bicentennial of Lincoln's birth, at the final meaning of the words Booth uttered. 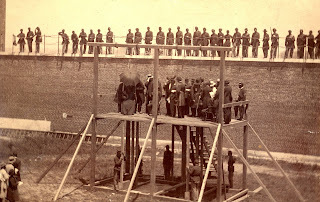 Booth's intended meaning-that tyrants shall always perish at the hands of the righteous-is flipped on its head, as it is Booth who has been remembered as tyrant and not the much-beloved President Lincoln. However, at the time of Lincoln's death, Booth was not alone in his hatred of the president. The divisive nature of the Civil War and Lincoln's Emancipation Proclamation precipitated several earlier threats, and a band of conspirators acted with Booth on that fateful night. Though documents like the newspaper announcing Lincoln’s assassination and photographs of the conspirators hanging are now collectors’ items, more interesting perhaps are the contemporaneous memorabilia produced following his death. 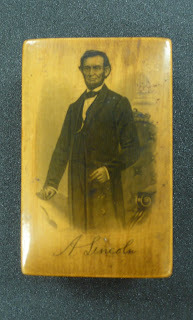 Lincoln’s visage has graced all types of goods, from the copper cent to bookends to postcards. 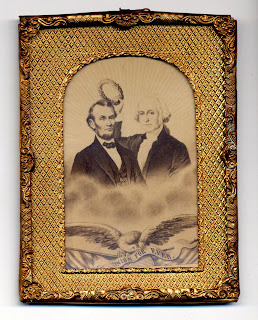 The collection of Lincoln memorabilia at Brandeis includes many of these posthumously produced objects. 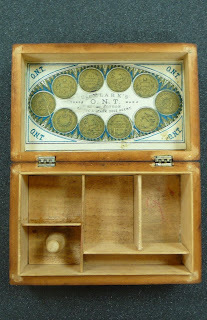 We also hold some more unusual pieces, like a small sewing box “made of wood which gre w near Alloway Kirk on the banks of the Doon,” referring to the River Doon at the town Alloway Kirk; a miniature book, Addresses of Abraham Lincoln, printed by Kingsport press in 1929, measuring 1.5 by 2 centimeters and containing four of Lincoln’s more famous speeches; a silhouette modeled on the Lincoln cent made entirely out of “worn out paper money destroyed at the U.S. Treasury”; and a carte-de-visite printed by Boston-based illustrator G.W. Tomlinson dating from 1865 and depicting George Washington crowning Lincoln with laurels. In addition to the types of objects showcased here, our holdings include letters written by Lincoln when he was living in Springfield, Illinois, as well as many printed photographs, lithographs, and engravings of Lincoln, his generals, and his family. As a part of the bicentennial celebration of Lincoln’s birth, the Robert D. Farber Archives & Special Collections department is lucky to be able to present not only this Special Collections Spotlight on our own Lincoln holdings but also a physical exhibit of Lincoln memorabilia collected by Brandeis alumnus Brian Caplan ’82, which opens on February 10 with a celebration in the Treasure Hall from 5-9 p.m. The exhibition will be on display in the Archives & Special Collections exhibit space through June of 2009. 1. Sarah Mark, “Tracking an Assassin,” The Washington Post, 14 April 1995.